One 1" wide photoluminescent tape, magnetic strip, 25' roll. Two photoluminescent peel and stick fire extinguisher outlines with retro-reflective backings. 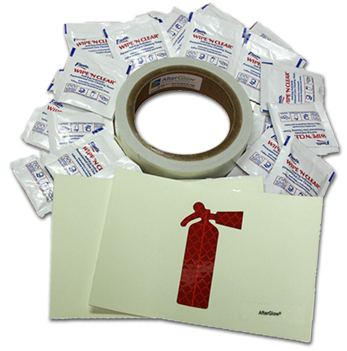 One package (100 count) individually wrapped disposable alcohol wipes. With the exception of the floor, light levels in the buttoned-up MRAP cougar during the day is sufficient to keep the PL materials fully charged. Once all light is removed, the fully charged PL materials will provide adequate light for a minimum of 8 hours of visibility. Once fully charged, DHi’s AfterGlow® brand PL safety materials are readily visible underwater and through smoke.